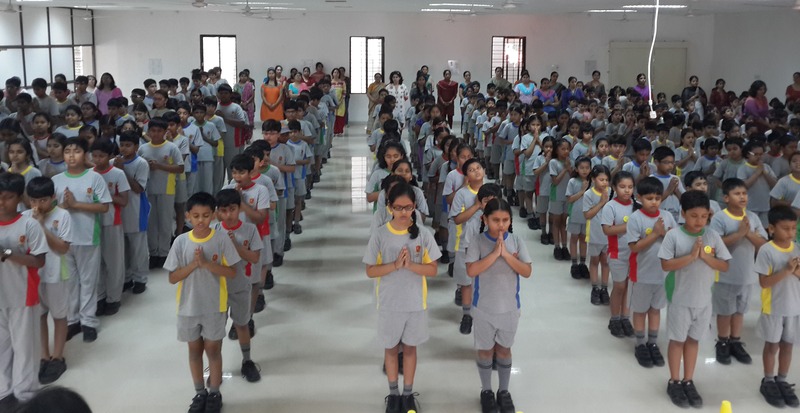 A sneak-peek at the first week at Suchitra Campus. We’d like to extend a big welcome to all of our families as we continue an enriching and exciting school year with your child at Suchitra Academy. On 16.06.14, Monday, we welcomed Pre-Primary children Back to School! We hope that you had a relaxed, fun-filled summer. It seems like everyone grew at least an inch over the summer! It is going to be an exciting year ahead for our Pre-Schoolers. 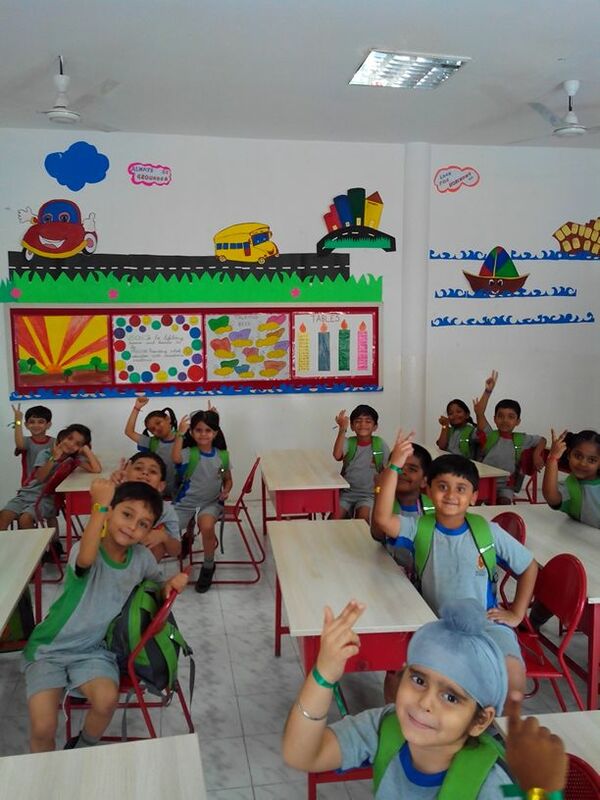 Our rooms are bright with walls scrubbed and freshly painted, teachers have prepared the classroom with colourful, meaningful, theme related WOW factor to make them inviting for your children. A new section- Jr. KG. C has been added. There have been few shiftings to balance the number of children in each class. We also have added few new teachers to our Pre-Primary strength. I am sure by now you might be having the name and contact details of the respective teachers. Our session began on the Monday 16thJune, with an introduction to the new theme – ‘Farm to the Table / Transport’. Children were excited to see the setup of their classrooms. Teachers’ effort of setting up the WOW factor paid off well, as the inquisitive minds were triggered by the displays. Loads of questions came out of the box and a rich discussion on the theme was prompted. Importance of ‘Father’s Day’ was also discussed. The session was summed up with children making ‘Father’s Day’ card for their Dad, and proudly carried it home for their Dad. Thursday 19thJune : Yellow day – children and all the staff members came were dressed in yellow making the day sunnier and more golden. We also conducted a show and tell activity with yellow objects. Children came forward confidently and spoke about their yellow object. Colour-days will be ongoing through the academic year. We will learn the primary colours first and then begin mixing them to see what other colours can be made. Sr. Kg. children are learning how to grade colours. Friday 20thJune : Dramatization (introduction to a farmer) : Teachers were all dressed up as farmers and put up a skit for kids to understand the importance of farmers in our lives. The learning was enriched when children tried to enact the skit themselves in the classroom. Sowing activity was conducted to understand the process of germination. Children have sown seeds in transparent cups and are watching it grow every day. Please check the child’s diary every day. Do not send your child with any jewellery, except stud earrings. See that your kid’s nails are cut and trimmed as they tend to hurt each other during play time. Children should come in proper uniform – no sandals and slippers to school. An extra pair of clothes with a plastic bag should always be in your child’s bag. Thursday, 12th June dawned and the campus wasabuzz with a lot of activity and excitement. It was the day the SCHOOL REOPENED after the summer vacations. Children were pleasantly surprised to see not only a few new classrooms, a new dining area but a lot of modifications at other places too! AND inside the class were some great-fun, ice-breaking activities and some small welcome gifts from their Class Mentors. By the end of the day, the new children had started feeling at home and were competing with the class in their talkativeness! I am sure your child returned home to tell you all about it !!!! On Tuesday, 17th June, Grade Iwent for a NATURE WALK. The spirit of adventure and exploration ran high in their veins. The children, along with their teachers, walked around the beautiful Suchitra campus and observed the various trees and insects found there. They were thrilled to find dried drumsticks and used them as rattles!! It was an enlightening experience to see the various trees like jackfruit, mango, Jamun etc and experience the texture of the leaves, the bark and the fruits. Dear parents, we are sure this education will stay with them for a long time to come. On Thursday, 19th June, the four houses Dhriti, Sanskriti, Prakruti and Sukriti had their house meetings to plan their strategy for the new academic session and discussed the upcoming competitions and events. Some houses elected their house captains too. Grade – VII played a beautiful piece on the guitar and mesmerized everyone. As you know the FA-1 (Formative Assessment) starts from Tuesday, 24th June. We hope that you are helping your child in the preparation for this assessment. The portions and time tables are being sent in their diary. Dear parents it would be great if you make time to give us a feed-back on how you find our newsletters, what else you would like to see in them, whether they are of any worth to you and what suggestions you may like to make to us. Unfortunately, I don’t even know if they add any value because it looks like such a one-way communication. the children come back refreshed and yearning to be back in school!!!. And I am also sure that you too want to be free of the constant plans you needed to make to keep your dear children occupied !!! So here we are ! all ready to get on with the business of teaching and learning. A lot kept happening while the children were away. As usual we had our Suchitra Sports Summer Camp. We had about 70 children enjoying a sports Gala during the summer break. A lot of activities were conducted, with swimming being the top most hit. It was an ideal opportunity for the children to enjoy the beautiful campus and play. When the children come to school on the 12th June they will be in for a few small surprises. Their classroom may have changed; even the wing may have changed! Dear Parents new classrooms are being added, space is being made to accommodate the growing number of students and the Dining Hall has moved !!! To meet the challenges of a growing school, more teachers have been appointed. Professional development workshops are being conducted for the teachers since 2nd June. There are workshops on (i) Project Based Learning (ii) Assessment and Evaluations defining teaching Methodology (iii) Identifying Learning Disorders (iv) Ideal Classroom Conduct and (v) School’s Vision and Mission etc. We are all geared up to restart the session and we are sure that we, as well as our students, will have a wonderful teaching learning experience. – Kindly ensure Punctuality. Children to be in school latest by 8.25a.m. – Kindly ensure neat turnout; be it hair ( two neat plaits for girls with long hair), shoes or uniform. – No fancy accessories (hair-clips, watches, dangling ear rings, bangles etc. ), polished nails, hair styling or make-up allowed. – No half-day school or going back after a test allowed. Please do not send a sick child to school, even if there is a test or an exam. We conduct continuous tests and a missed test is of no consequence please ! Dear parents, specially the new ones, please feel free to revert to me in case of any confusion or assistance.